Snip off ends of beans; drop a third of the beans at a time in boiling water for five minutes or until tender and crisp. 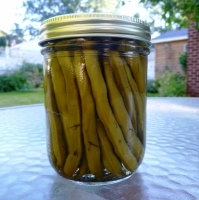 Lift beans out with slotted spoon; pack upright in sterilized pint jars. Place two tablespoons dill and a half clove of garlic in each jar. In a saucepan, bring water, vinegar, salt, sugar and cayenne pepper to a boil; pour over hot beans; seal jars. Place jars on rack in large canning kettle. Add hot water to cover jars. Process by keeping water in kettle at simmering temperature for 10 minutes. Makes 4 pints. Recipe categories: Lunch/snacks, Appetizers, Vegetables.